Two Tadano GR-1450EX cranes have been selected for a destroyer construction project by the Australian Submarine Corporation (ASC) following a competitive tender process. Tadano Oceania has been chosen to supply two GR-1450EX rough terrain cranes for a warship construction project in Adelaide. The ASC’s shipyard at Osborne in Adelaide’s north-west is a high security site where all six Collins Class submarines were built for the Royal Australian Navy (RAN). ASC’s second shipyard, ASC South, was opened in 2010 and the first keel was laid for the HMAS Hobart in 2012, which is the first of three Air Warfare Destroyers (AWD) ASC is currently building for the RAN at the Common User Facility (CUF). A large 1000 tonne crawler and several smaller mobile cranes are already on site but the ASC needed a crane to meet the specific needs of the final stages of destroyer construction, once the first hull is launched. The crane in question had to have a lift chart which would allow a shore-based crane reach to the middle of the ship’s hull floating beside the CUF dock. A tender was released calling for a crane that could lift 5 tonnes at a boom extension of 55m at 34.5m radius. A rotation of 360 degrees was also required. An additional requirement was to lift 4.9 tonnes at 60m boom extension at 37.5m radius. Following the competitive tender process, the contract was awarded to Tadano Oceania to supply, deliver and maintain two GR-1450EX rough terrain cranes. According to ASC strategic sourcing specialist Roger Wilkinson, the tender panel was extremely thorough in its assessment of the submissions and at the end, Tadano emerged as the preferred choice. "The Tadano proposal was further enhanced by an extended service agreement and the availability of 24/7 service support," he says. The Tadano GR-1450EX is an all-wheel steer crane making it a nimble machine on a tight worksite. It features a four section boom which extends from 13.1m to 61m. Additional reach is achieved through the addition of a bi-fold jib section which adds a further 10.3m or 18m. The Tadano GR-1450EX is rated at 145 tonne capacity at 2.5m. "Our intention is to keep the two Tadano GR-1450EX cranes for more than ten years," Wilkinson adds. "We have ongoing work with the AWD project and the possibility of contributing to future naval shipbuilding projects such as Future Frigates." 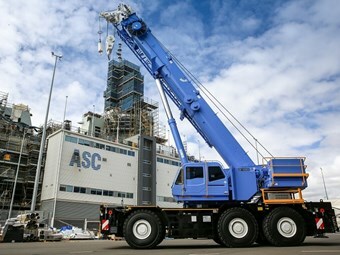 The first Tadano GR-1450EX has been delivered to the ASC and is operating on site ahead of schedule with the delivery of the second crane just weeks away. Both cranes were shipped to Adelaide where they were pre-delivered by the local Tadano agent Adelaide Crane Maintenance. Local training and support was also provided to ten operators at ASC.